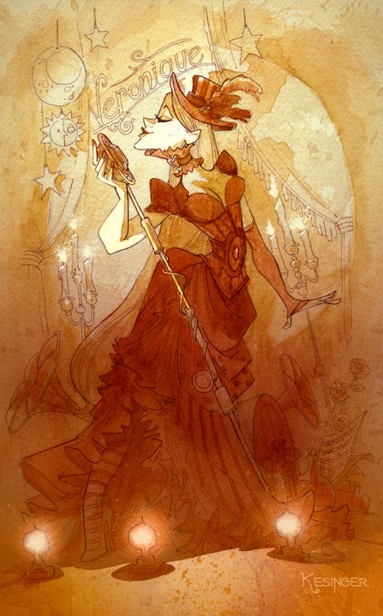 The woman in the above image by famous steampunk artist Brian Kesinger is none other than Veronique Chevalier. If you’re into the steam scene, then you are certainly no stranger to her humorous songs and extravagant performances. One year before she released her debut debut album Polka Haunt Us (and two years after she made her first appearance onstage), she noticed there were no songs related to the Festival of Lights that related to horror or the supernatural in any way. Considering how the dreidel in the famous song is made a clay and golems are made of the same material, you would think someone would have recorded a parody version (especially given the number of lyrics for such an effort being available online). As a result, “Bubbe’s Hannah Cat (Hanukkat)” was born! Special thanks to Veronique Chevalier for use of the image! Merci for so kindly highlighting my absurd ditty. (Or maybe a better term is “lowlighting”?) In any case, Fang You very much!